Platinum or bromide photographic enlargement (23 ¾ x 19 ¼ in. ), mounted on board. Matted, glazed and framed. George C. Cox, one of the great American portrait photographers of the late nineteenth century, “was a friend of many artists, including Saint-Gaudens, who had plans to make a bust of Whitman, and who probably arranged for Whitman’s photographic sitting with Cox so that he could have photos to work from for the bust (which was never completed). 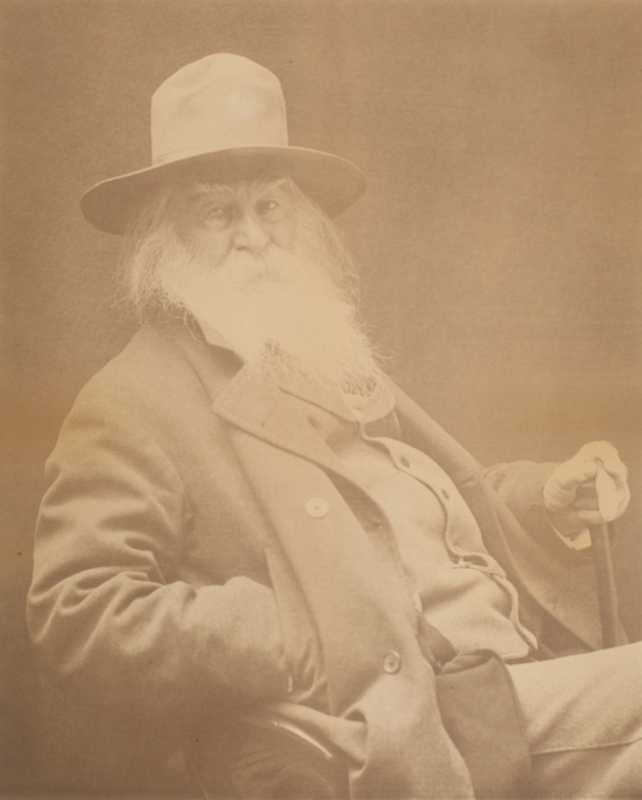 … [Whitman] considered Cox the ‘premier exception’ among photographers because he paid him royalties for the sale of his photographs.” (Folsom, “Notes on the Major Whitman Photographers”). This is easily the largest and most visually impressive photograph of Walt Whitman that we have ever seen.